Nick Bilbrough has been involved in the field of language teaching for twenty-five years training teachers in Africa, the Middle East, South America and Europe and is a regular presenter at conferences worldwide. I recently caught up with him at the Image Conference in Athens where I was running a drawing workshop and he was presenting. Nick is particularly interested in classroom interaction. In terms of materials, he prefers materials light approaches to teaching such as storytelling, drama and dogme ELT. He is the author of two resource books in the Cambridge Handbooks for Language Teachers series; Dialogue Activities (2007) and Memory Activities for Language Learning (2011) and more recently Stories Alive (2016) published by the British Council. 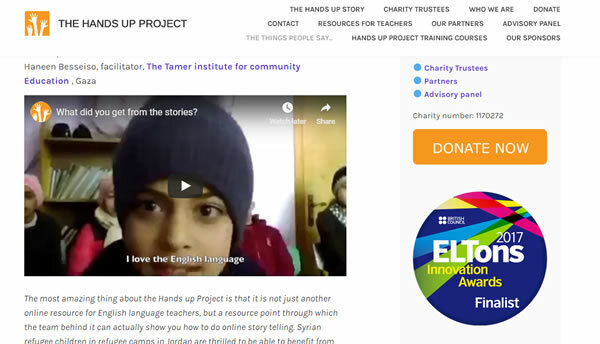 Nick now devotes his energy to the registered charity he set up The HandsUp Project, telling stories and teaching language online for young learners in refugee camps, mostly in Palestine. In 2017 ELTons Innovation Award Judges shortlisted the project. With an MA in Drama in Education from the University of Central England, the synergy between language learning and storytelling was already sitting there. Some years ago, he became involved in storytelling projects in Palestine. It deepened his understanding of how very powerful and memorable stories can be as vessels to contextualise English language learning for children. 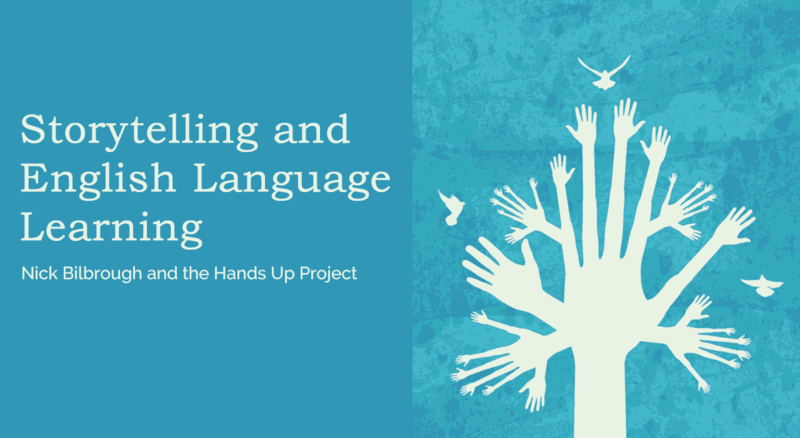 It was with these ideas in mind that the Hands Up Project was born. Right at the time of writing there are more than 40 volunteers around the world. Their bases are in Japan, Vietnam, Brazil, Chile, and Russia to name a few. They give their time to connect to kids. Sometimes to tell stories and do other online learning activities, at other times it is to listen. These teachers work with Palestinian and Syrian children and their teachers through the Hands Up Project. "We connect mostly to classrooms in Gaza and the West Bank and to Zaatari, a Syrian refugee camp in Jordan. We connect through a tool called zoom, doing storytelling and drama activities. We aren't teaching English as such, because they have brilliant teachers in their schools. Relief International, our partner organisation in Zataari, supports those teachers. So it's really about giving them opportunities to use what they are learning. A time a long time ago, I wanted to be an actor. I went to drama college in Denmark a long time ago. I had to act in Danish. I quickly realised that I wasn't very good at acting, but I became interested in the use of drama techniques in learning a language. I found for myself that they were really powerful tools for learning Danish - having to act and improvise in that language. Mario Rinvolucri calls storytelling the oldest language teaching technique in existence. If a curriculum just consisted of telling stories and enabling learners to tell stories, you would have pretty much everything you need for language learning to take place. Storytelling is very resource-light. It doesn't require anything more than the human voice. It can be done in very large classes with huge numbers of learners and very little equipment. This is ideal for a place like Gaza where there are regular and weak internet. Story should be a very important part of eduction. 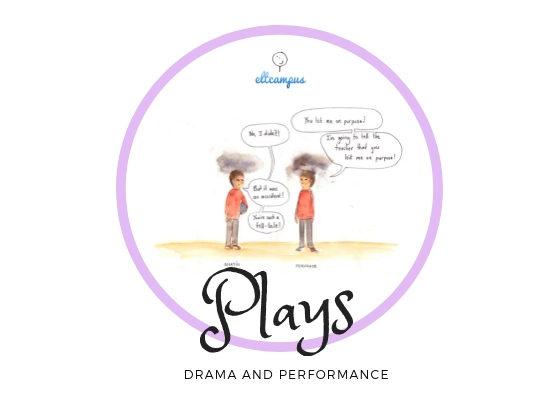 We run a play writing competition for Palestinian children. This will be the second one this year (2018). When we announced it, we were expecting to get just a few entries. We've received 88 entries. The brief was to make a five minute play with a maximum of five actors. They had to send us a script of the play and the video of them performing it. We had an amazing range of entries. Some of the plays told traditional Palestinian stories which they adapted to a play. At other times, they were stories based on their lives in Gaza. Stories about the blockade and shortages of basic necessities and the problems of occupation. We don't encourage children to tell stories that are too personal. A lot of children, particularly in a place like Gaza, have experienced trauma. They've experienced lose of family members. And there is a huge feeling that they live in a massive open air prison. So, there is a lot of trauma, a lot of children suffering from a lack of confidence. But what was interesting about them was how universal many themes are. I think story can be very powerful when it is used metaphorically. I want to stay clear of people bringing up very, very personal things because you need a lot of support when those things come up. It's not always the right environment, especially working online. The other day, I was working with a class in Zataari, a group of Syrian girls and I told them the story, one of Aesop's fables - The Lion and the Mouse. Afterwards they all took it in turns to come up to the webcam and say what they got from that story. In this case, they spoke in Arabic and the teacher translated for me. My Arabic isn't good enough. But it's really interesting to see how a simple story like that can be like a framework where you can hang your life. It's more powerful when it's not in your face. We're about to publish a book that will be free to download as a resource for teachers. It doesn't matter where you are in the world, you'll find ways to connect.there will be things that you will identify with in these stories." When I left Nick, in an upstairs lecture room at New York College where the Image Conference was being held, he was waiting to connect to Gaza to tell a story. If you want to donate your time to the project or support it financially, see the links below. 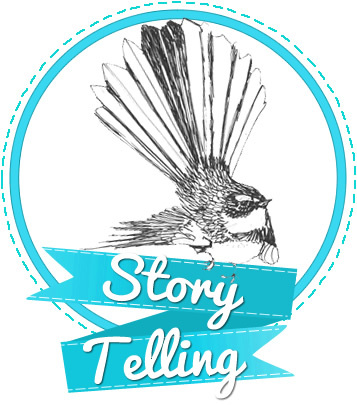 Find out more about storytelling and young learners with a free short course from ELTcampus! If you are teaching children and want to know more about how to use storytelling in your classroom, why not further develop your teaching skills and sign up for a free short ELTCampus course about storytelling, with 6 informative engaging lessons sent direct to you. Visit to the classroom at storytime so we can see what storytime can look and sound like. See how storybooks support language aurally and visually, and establish what criteria you can use to select appropriate picture books for storytelling. Look at approaches and ideas for storytelling that you can use in the classroom that focus on speaking production and listening comprehension. 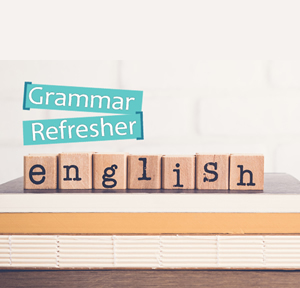 Discover some resources to help you with storytelling lesson planning and analyse the stages of an example lesson plan based around a short video. Plays and drama for spoken production development. Founding member of Pilgrims, EFL teacher, teacher trainer and editor of Humanising Language Teaching, Pilgrim's website for teachers.